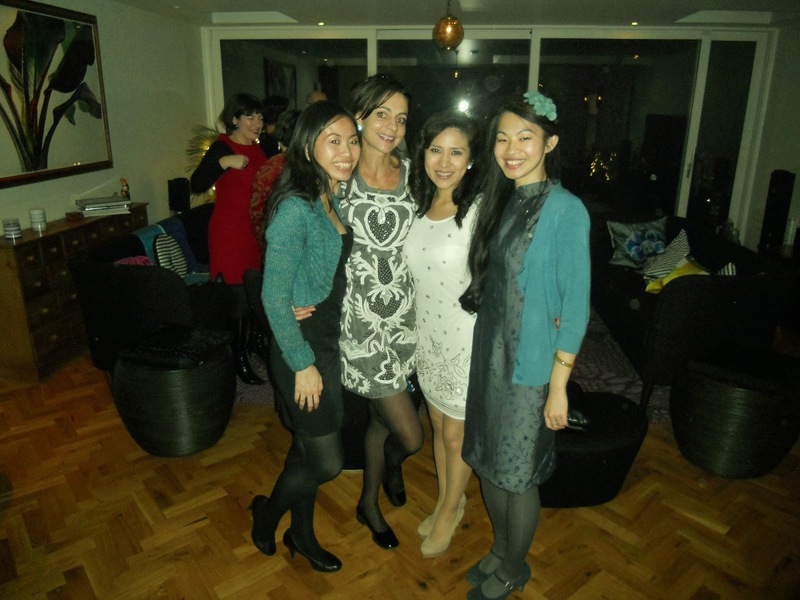 Review & LookS: Happy New Year 2014....with the Lady General's 'Wang' Cheongsam! BouBou dreaming with me....in his very first photo of the new year 2014! Happy New Year 2014 my lovely darlings! I trust you darlings have been having a swell time celebrating our new year and are fuelling to make a stamp with all your new goals. Rather than being a resolution sort of girl, I have begun the year with some dreams I hope to achieve in the coming few years....deciding-ly writing them down and sealed in a tiny bottle ready for the open waters. As my girlies and I are planning a trip to the seaside town of Southend, where we hope to take a walk on the world's longest pier whilst watching the energies of the sea fuel us back to positivity and giving us renewed strength to carry forth our new dreams or wishes...weary of polluting mother nature, my bottled dream is the tiniest bottle I could find in the craft shop which perchance may act more as a time capsule for a stranger to find one day. 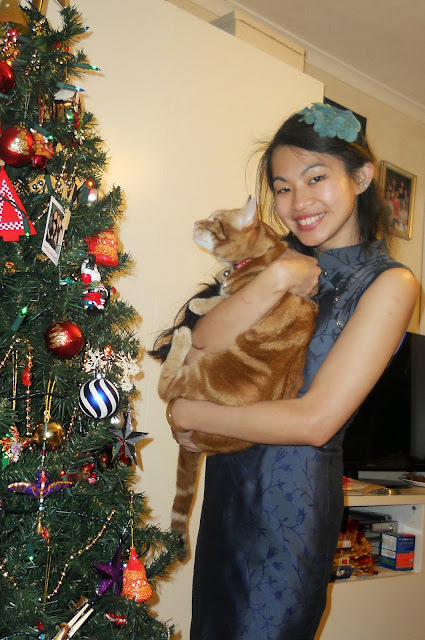 Perhaps it is quite romantic, but I have actually begun this new year in a rather sweet waving my beau off to war sort of fashion that is inspired by the 1940s and taken my own unique spin by wearing a Cheongsam (Qipao) for solar new years (as well as lunar new year later). 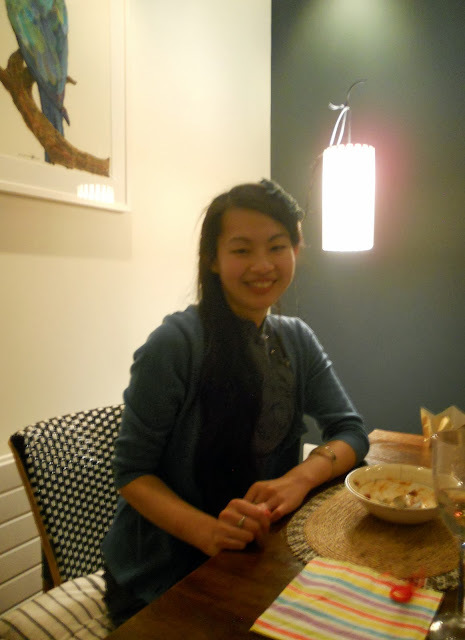 Having a New Year's Eve dinner to attend at my lovely friend Claire's beautiful home in London, I was excited to dress to the occasion and decided to wear the blue silk burnout 'Wang' Cheongsam [link] the Lady General e-store has sent me a little while ago for a review. I just love the muted floral pattern climbing across the beautifully soft light silk of this knee length classic 'Wang' Cheongsam from the Lady General [link] as it wrapped around me, and the functional Vintage style buttons across one side of the chest is certainly a pretty feature that makes it a tad bit more modern. Though slightly more tricky to iron because the material is so silky soft and mistaken creasing can be easily formed, it is certainly worth the extra little bit of care. Simply accessible with a concealed back zip and metal snap buttons at the back of the soft mandarin collar, it has an understated chic sheen of greyish blue and a short back slit...that ensures even the most novice of Cheongsam wearers will be able to avoid the challenges of overexposing oneself, which is more possible in the conventional side slit Qipao. A contrasting pretty purple lining ensures that one's modesty is protected and has been neatly sewn into the hem to ensure nothing is accidentally revealed through the light silk. It is a Cheongsam that though unconventional in certain ways with freshly unique designs...has somehow stirred 1940s inspiration within me and I instantly knew the handmade felt hair piece from Swell Dame I recently picked up at the Christmas Mid Century Market in London would go hand in hand with it. 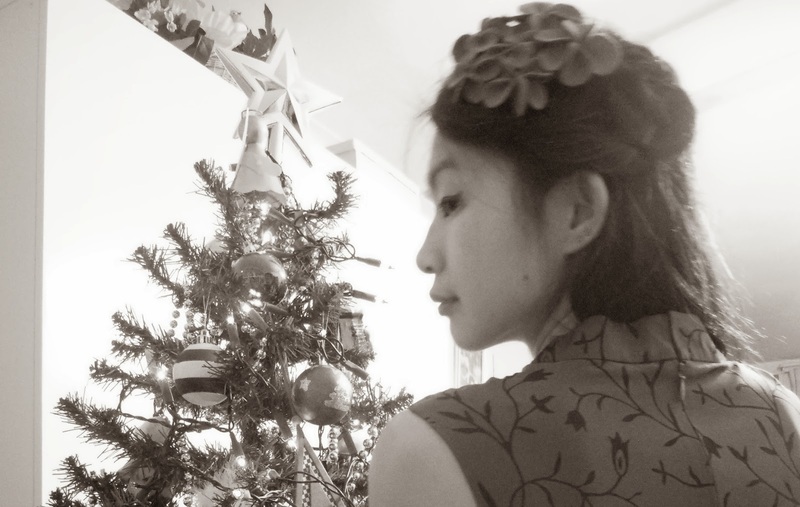 So curling the bottom length of my hair and with some pin curls set in place, I was perfectly matched with the Lady General's 'Wang' Cheongsam and ready for the exciting New Year's Eve dinner! My first photo of 2014! 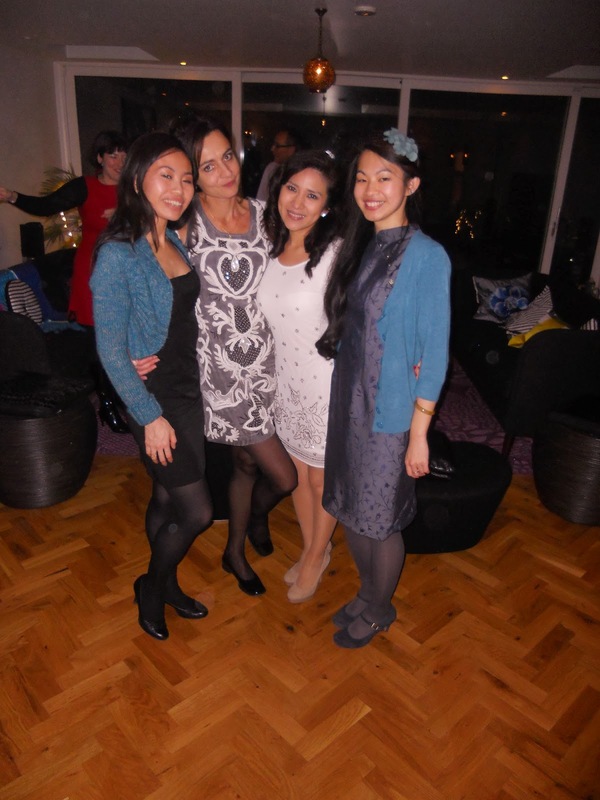 With my lovely girlies...our first New Year 2014 photo together! A 1940s inspired look to welcome 2014! BouBou still fascinated by the Christmas tree...on New Year's day. BouBou had a slightly glazed over expression....probably surprised by the flash! Closer detail of my 1940s inspired hairstyle with pincurls and hair piece by Swell Dame! Back home on New Year's morning....presents still waiting under the tree for my sister in Singapore! There shall be more to come with the Lady General in a Walking In May exclusive, which is all I can excitedly say for now. [Don't forget upcoming Cheongsam designs can be found at the Lady General's Facebook page: www.facebook.com/theladygeneral.sg] Also apologies in the delay of sorting out the 1920s inspired Gatsby Giveaway as the festivities have kept a tight reign over my recent schedule, but the winner shall be randomly selected and announced in the next post. As it is still early in the new year, I wish all you darlings a fabulous year ahead...and every good luck in hunting for that Chinese New Year Cheongsam (Qipao) if you should be looking! May, I love your dreams and that dress is absolutely divine. Looks charming on you!